New manager Paul Lambert met Town fans for the first time at the annual Meet the Club event which preceded the Supporters Club’s AGM in the Sir Bobby Robson Suite this evening. The 49-year-old, who was joined by assistant manager Stuart Taylor, first-team coach Matt Gill and fitness coach Jim Henry, took questions from the floor for just over half an hour before members of the club's off-field staff were also quizzed. He says he’s aware it’s important for a boss to make themselves available to supporters with around 140 present at this evening's meeting. “Every manager becomes accountable, the supporters are the lifeblood of the club,” he said. “The most important people at any club are the supporters and the players. After a week of talking to the media and now fans following his appointment last Saturday, Lambert will lead a team out for the first time at Portman Road on Saturday when Preston visit. Following Lambert’s question and answer session, MD Ian Milne was joined by other members of staff - finance director Mark Andrews, club secretary Stuart Hayton, director of sales Rosie Richardson, director of retail operations Lee Hyde, head of ticketing Donna Powell, media manager Steve Pearce and Tim Claydon from Centerplate, who provide the club’s concourse catering - to answer fans’ queries before the Supporters Club’s AGM. You can read our live blog of the evening on the TWTD Forum. Thanks to Phil for this evening's blog. I think this appointment of Lambert and his team has given us the best chance possible of turning this round. It is a big ask but how refreshing to hear our manager sounding like he really believes we can stay up. Hurst seemed to have given up believing and made it sound like we had a 1 in 4 chance or something like that. Lambert has all the experience and none of the baggage so let's back him all the way. For starters you need a centre back 6.2 foot or taller who can win a header in the box . a couple of midfielders who can actually pass something other than water and a goal poacher who as Roy put it would kick their own granny to score a goal. Start hunting through the free agent list because we don't have anyone who comes close in these areas. Did anyone attend who could share any tidbits as to what was asked/ how he answered? Feeling confident that Lambert is the man to turn it round for us. He is being realistic with out promise, that's novel...… now for the meaningful part. Odd comment Shakeytown. Beattie wasn't 6'2", Des Walker wasn't 6'2". Two of the best ever centre backs. Warky isn't 6'2" butbread the game so brilliantly alongside David Linighan he seemed to win every ball. Our present defenders can shut up shop - Lambert and his team just need to drill them. A lot of bald heads in the audience. Consequence of ITFC supporters tearing their hair out? rfretwell. still living in the past are we??? ?Strikers were a lot smaller 40 years ago as well so as good as they were they would be bullied off the ball easily nowadays and would not win a single header which if you actually watch our sad performances you would know that we are the worst team in history at set pieces. If you really think that the likes of spence and nsaila and co can do the job you are dreaming. Agree Shakytown especially regarding the midfield situation..we haven’t had a truly decent midfielder who could pick out a pass since Magilton retired..Huws & Bishop are capable but utterly useless unless on the pitch. Glad we’ve got a manager who was a classy midfielder himself as he’ll know better than anyone that this problem needs resolving fast. Amazing the difference a week in football makes - have to say i’m looking forward to the battle ahead this season now compared to the last few weeks under Hurst who looked like he had pathetically given up. I think PL could just be the perfect appointment. Reading about his time at Stoke it seems quite a few players had had enough and were totally unprofessional - what a time to be a manager at that sort of club when you're fighting relegation too. He has the opposite problem here, a young and inexperienced squad desperately looking for guidance, which could be right up his street. It's just a shame that there doesn't seem the energy and 'spirit' in the club at the moment - and that comes from the top. I swallowed a ton of pride and watched "Paul Lambert, Norwich City highlights" on YouTube yesterday: if he can drill us as well as he drilled them (mostly youngsters and journeymen) then we can fight our way to mid table. It seems like the days of 6 years ago, but actually I think this league is going to be easier in terms of there being 2 or 3 teams that are definitely rubbish (but we still got beat by them first time round, so who knows!) There won't be a team going down with 54 points this time, put it that way. No, Kevin Beattie wasn’t 6 foot 2 ... but he had Allan Hunter alongside him! My view is that Allan Hunter was a much better defender than people remember. 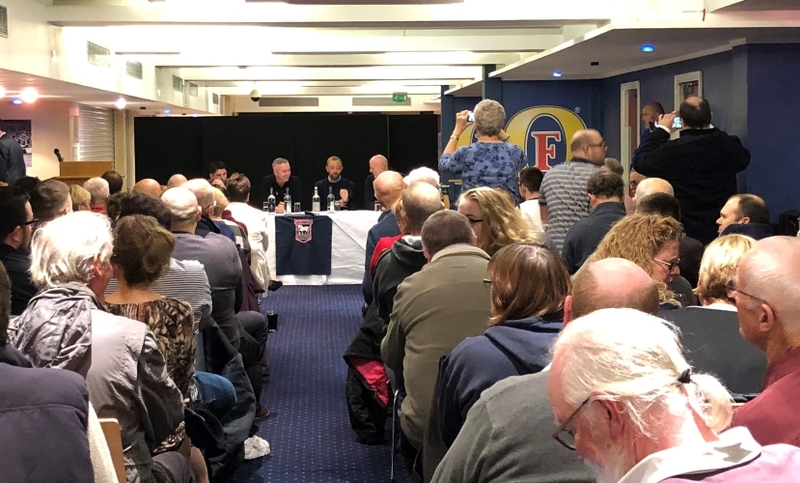 "New manager Paul Lambert met Town fans for the first time ..."
Looks more like someone got confused and put the crowd that's come for the caravan auction into the wrong room. I know we're a family club, but what must the new team think when they see that lot? Was it pension pay day? Bizarre comment regarding Alan Hunter, personally I have never heard anyone suggest that he was anything but an outstanding International top top player. Lightningboy. Agree about the midfield and I think this has always been the main problem. I hope Huws and Bishop can get on field soon but are they really all that good???? I personally don't think they are more than good average squad players. rabbit, i think the point Ipswichbusiness is trying to make is that it didn't hurt "The Beat's" reputation to have a defender of "Big Al's ability beside him, both without question (in my opinion) easily two of the best central defenders of the last 40 years or so, though KB had that something extra! In addition, if my memory serves me right, Billy Baxter (yes, i'm that old!) was only 5ft 9ins, and frequently outjumped players several inches taller! A defender not so very far behind the previous two giants of ITFC!